My grand mother prepares mutton curry in a different method using gambooge / Kudampuli / Vadakkan puli. During my childhood days on every visit there, I wondered how she prepares it differently. Recently only I learned that, its the gambooge tha’ts giving the different taste to her preparation. 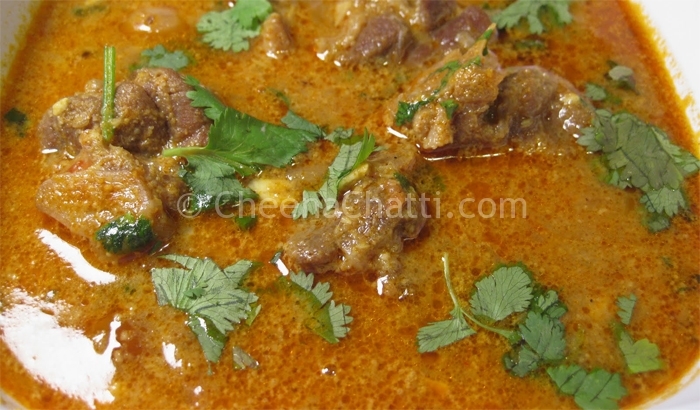 Try this spicy mutton curry recipe yourself and let me know your comments. You can serve it with Appam, Idiyappam, Pathiri etc.. Blend together Corriander powder, Chilly powder, Turmeric powder, Ginger, garlic, cloves, cinnamon, white poppy seeds, cumin seeds and the coconut. In a pan, pour some oil and add the onions. Saute it till onions become brownish. Add the mix (#2) in to the pan and saute it for another 10 minutes in low flame. Add the mutton pieces and pour some water. Cook it for some time. Move the curry into a dish and decorate with the Coriander leaves over it. Have you tried our other mutton recipes too? This entry was added on April 9th, 2013 by Renoos in Non Veg and tagged with how to make mutton curry, spicy mutton curry, kerala mutton curry, tasty mutton curry, mutton curry recipe, non vegetarian, mutton, mutton kulambu. Last revised on April 4th, 2018. @Shridhar : That combination is really great. We usually follows the same at home. kodumpuli for mutton curry? this is instead of tomato? Is it really good? @Raj: First time myself also got confused :). But its a really tasty preparation. hi! iam an anaesthesiologist.just hung up my steth foodie.used to try some cooking whenever my wife is away.tried your mutton currybut used lot of tomato puree instead of gambogi.great.thanks. Thanks for trying the recipe. I believe your family loved the dish with the changes. @Rivaann: thanks for the comments. Glad to know it came out well for you. Please share how your granny prepares it. @Ashwiin: Gambooge (garcinia cambogia) is called as Kokum in Hindi.